Camp Kinderland – Unforgettable Summers in Greece! Internationally respected as the cradle of western civilization, Greece is a beautiful country rich in culture and heritage and the birthplace of the Olympics. Appreciated for its magnificent natural beauty and famous for its warm hospitality, Greece invites you to fall in love with it. 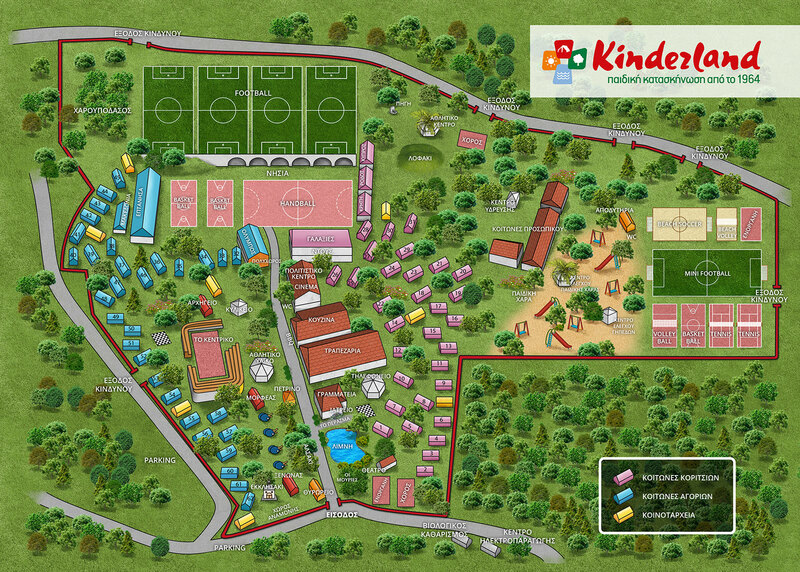 Camp Kinderland is one of the most reputable and contemporary camps worldwide and offers campers from around the world a wonderful, fun-filled summer experience in a friendly, family, warm atmosphere. A magnificent summer camp, outdoor education center & athletic complex with a long tradition of excellence since 1964. Inspired by our firm belief in the many benefits of camp life and true to our principles, we have created a fantastic environment that offers campers from around the world an amazing opportunity to experience high quality summer vacation in Greece. Kinderland is located on a beautifully landscaped property near the town of Kalamos, Attica, only 45 minutes northeast of Athens. It sits in a picturesque setting overlooking the beautiful coast of northeast Attica, just 3 kilometers from the beautiful Aegean sea. This superb location combines mountain peaks and sea views in perfect harmony.